Don’t Miss: The visit to the amazing ‘Dripstone’ cave! Alanya, the beautiful multicultural, historical city filled with long sandy beaches, stunning natural parks and a wonderful Mediterranean climate which bewitched even the notoriously hard-to-please Cleopatra, is sure to bewitch you on this exciting full-day coach tour from Side! 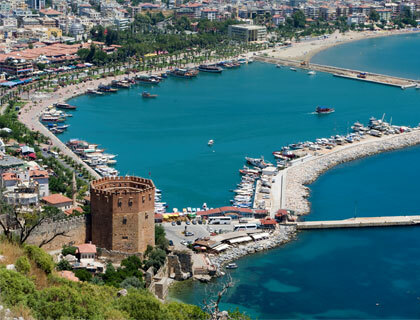 Visit the beautiful city of Alanya on this popular full-day tour. Stop at a banana plantations, Alanya Harbour and visit the famous ‘Dripstone’ cave. Take a scenic boat ride along the Dimcay River. Enjoy a tasty lunch overlooking the river. Enjoy free time in Alanya to explore at your own pace. Includes round-trip transfers from Side and nearby resorts. Alanya is without doubt a city that has something for everyone, with its long, fine-sand beaches, crystal-clear seawater, historical and cultural riches, cosmopolitan lifestyle, spectacular parks, warm Mediterranean climate, contemporary boutiques and bustling bazaars. On this full-day coach tour you’ll start with a visit to a banana plantation, followed by a photo break at panoramic viewpoint near Alanya Castle which overlooks the beautiful Alanya bay and its busy harbour. Next, you’ll travel down to the harbour to see the famous ‘Dripstone’ cave which was discovered in 1948 whilst mining for the construction of the harbour. The small chamber, although named as the Dripstone cave after its dripping stalagmites and stalactites, is also known as the Damlatas cave. After the 95% humidity of the cave, you’ll be ready to cool off and you can do just that on an hour-long boat ride which offers fantastic photo opportunities as you travel around the stunning coastline. Lunch (included) is next – a tasty trout or chicken kebab enjoyed at a picturesque spot on the Dimcay River – the perfect place to relax. After lunch, you’ll head down to central Alanya where you can spend two hours free time exploring the shops, bazaars and many historical buildings before beginning the coach journey back to Side. The Alanya Bus Trip includes an English-speaking guide, entrance fee to the dripstone cave, the one-hour boat ride, lunch and round-trip transfers from Side, Manavgat, Gundogdu, Colakli, Evrenseki, Kumkoy and Titreyengo hotels. 1st April to 7th October: Wednesdays and Fridays. Entrance fee for Dripstone Cave.